Ponder this for a moment: playing more than an hour and a half of music brimming with harmonics, octave runs, left-hand pizzicato, high-speed arpeggios, up-bow staccato – all the fanciest licks and tricks you can imagine on the violin – with a Spanish flair. The married violinists Gil Shaham and Adele Anthony seem to take things in stride. Not that they didn't have to practice like crazy to prepare for the creation of the recording they released today on their own record label, Canary Classics. "I don't remember ever preparing this hard, working this hard," said Gil a few weeks ago, when I spoke with both him and Adele over the phone. "There were times when we were playing late at night, here, squeaking up in the high register...We're lucky to have tolerant neighbors." The recording, Sarasate Virtuoso Violin Works, was made in Valladolid, Spain in 2008 at ¡Sarasateada!, a festival celebrating the centenary of the great violinist Pablo de Sarasate (1844-1908). "It was just several months of one or the other of us playing really high, fast music. It really took a lot of practice to get it all ready," Adele said. "The more you listened to it, the more exciting it became. It was nice to hear Gil practicing his pieces that I wasn't playing, to get to know them vicariously." When they performed at ¡Sarasateada!, "it was really kind of fun to play in front of a Spanish audience, with a Spanish orchestra," Adele said. "The audience was so familiar with Sarasate. They enjoyed the pieces they knew well, and they knew a lot of background for the dances. They had posters up everywhere, with big pictures of Sarasate on them...It was a lot of fun. It's always nice to record things, but there's nothing like performing them in front of people, getting some reception. Some of it we recorded live, and some we just recorded, but it was all done in Valladolid." Gil and Adele not only recorded the pieces we violinists know, love and often struggle with, like Zigeunerweisen, Introduction and Tarantella, Zapateado, Habanera and Carmen Fantasy, but they also unearthed a few lesser-known works. "Discovering more about Sarasate was amazing. We are really lucky to have this legacy," Gil said. "Maybe my favorite track on the disc, and definitely one of my favorite pieces, is the 'Song of the Nightingale' that Adele recorded, which is so beautiful. It's true, Sarasate likes all these difficult techniques, but it really is always in service of a musical message, which kind of magically appears. A lot of his other published works are arrangements of operas and works that are 'in the style of' Scottish airs, or Gypsy airs, or Spanish airs, or Spanish dances. This one is really a Sarasate-original composition. I think the same is true of Romanza Andaluza. He very humbly calls it an Andaluzian romance, but it really is a very beautiful original composition. I find that the writing has incredible perfection to it. It's very concise, it's meticulously clean, full of melodies and full of imagination." "It was kind of an eye-opener," Adele said. "I've grown up with Sarasate, my whole violinistic life, but to discover all the repertoire he wrote – the rest of his compositions are really quite amazing. When you're younger you just learn the famous pieces that everybody plays. When we were choosing repertoire, looking at all the things he wrote, it was hard to choose! They were all interesting in their own way. I lucked out with the 'Song of the Nightingale' – that's a very interesting piece, and it's unlike any of his other compositions. It really describes the nightingale, perfectly, with a Spanish flair, and with all the violinistic fluency that comes with Sarasate. He always manages to get some left-hand pizzicato in there! It's a very beautiful piece and I really enjoyed playing it." That's not to say they didn't enjoy doing the old favorites. "I also love 'Introduction and Tarantella' – I've been playing that piece since I was young, so it's something that feels very at home to me," Adele said. "And we also always enjoy playing 'Navarra for Two Violins' because it's just kind of a crazy, fun piece. It's hard to take it really seriously! When we play it it's always so much fun." I wondered what the biggest challenge was, playing so much Sarasate. "(The Nightingale) has a lot of harmonics, and the challenge is to make it sound fluid, singing and melodic," Adele said. "In Sarasate, (the challenge is) always trying to make things sound effortless, so it doesn't impede the musical flow. But he was also a violinist, so he wrote very well for the violin – everything is possible, if you work at it hard enough." Both Gil and Adele found inspiration from the rare recordings that Sarasate himself made in 1904. "The legacy of his recording is so staggering," Gil said. "He's in his 60s, it's 1904, and since it's 1904, you know (the recording is) all done in one take. He's playing his own compositions. I think there are only eight works that he recorded. These are works that were recorded by all the greatest violinists of the 20th century. Sarasate's technique is so clean, and his sound is so beautiful, and his style is so perfect." "A lot of people say that those older violinists weren't clean – but he was just amazing," Adele said. "He was just a great, great violinist." I wondered what life is like for this married couple, both touring violinists, who have two children, Elijah, 6, and Ella Mei, 3. First of all, not every married couple can also work together. How are they able to do this kind of intense project together, without wringing one another's necks? "We don't play together very often, but when we do, we really have similar musical tastes, luckily," Adele said. "The nature of our relationship is not competitive, so we really enjoy playing together, we have a lot of fun. It's nice to play with someone you know so well, and you don't have to work on the more fundamentals. We always enjoy it." As for the kids, "we try to make it work as best as we can," Gil said. "We were very lucky, I started working very young, and so when our son was born, I was very lucky to be able to cut back. So both of us play a lot less. We try to play as much as we can around New York, keep it close to home. Nowadays I try to play about 50 dates a year, and Adele does about 30. It's so complicated! Now we have four schedules around the house. We try to work it so that when Adele is working, I'm free, and when I'm working, Adele is free." And if they are playing together? Sometimes they just take the kids on the road, Adele said. "Your priorities completely change, the kids are the number one priority," Adele said. "We both really enjoy playing. We have limited time to practice and prepare things, and sometimes it's a real escape, to get away with your violin for a little while...maybe I enjoy it more now! We juggle our schedules, we've cut back on a lot of things so we can be home more with the kids. You don't want to miss out on the important things. I feel like we're very lucky, because we have flexible schedules to some degree, that we can spend a lot of time with our family and still have our careers at the same time. " As for projects this fall, Gil will be touring, playing many works from the 1930s. "When I was thinking back to violin concertos, I noticed that many of my personal favorites were all written in a very short period of time, between 1931 and 1939," Gil said. "The list is staggering, and it kind of reads like a music 101 course: Stravinsky, Berg, Bartok, Schoenberg, Prokofiev, Samuel Barber, William Walton, Benjamin Britten, Hindemith and Milhaud – they all wrote violin concertos at the same time! I love all those pieces. They're so different, too. Roger Sessions wrote a beautiful concerto, and Szymanowski, and Ernst Bloch. What an amazing time. 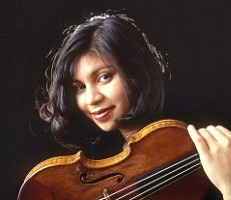 It was kind of a coincidental confluence of violin concertos by great composers." Gil said he is not the only person to have noticed this. "When I played Stravinsky Concerto, earlier this season in Cleveland, I was speaking to a gentleman on the radio broadcast, and he said to me, 'What is it about 1930s, everybody was writing violin concertos, was it something in the air?' " Gil said. "And when we played it in Washington, one of the patrons came after the concert and spoke very eloquently. He said that the 1930s were a time of great turbulence and trepidation, and the feeling among the population was as if they were standing on top of a volcano, ready to erupt. Then he asked, 'How is this reflected in the music of the time, and how does that relate to our times, and to the music of our time?' Great question - and one that I'm not equipped to answer. It's very interesting to think about, it's very thought-provoking." He'll be playing the Alban Berg Violin Concerto with the Los Angeles Philharmonic under Gustavo Dudamel in November, a concert I hope to report on! Gil Shaham plays Sarasate's "Carmen Fantasy" in 2006 with Berlin Philharmonic, Claudio Abbado conducting. Sarasate, as evidenced by his 1904 recordings, was a truly phenomenal player. We delude ourselves to think ill of him or any of his generation. Any recording of his works is an homage his peerless playing. 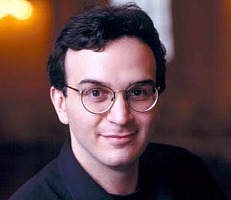 I've always liked Gil Shaham. He's lucky to have tolerant neighbors... haha no - his neighbors must feel lucky! I jest. Great violin duo, great music by Sarasate. Looking forward to that CD. I'd certainly volunteer to be their neighbour - and have the chance to eavesdrop on their violin playing for free! Definitely a CD for my "must have" list. Edit to add: I've now forwarded that hilarious and very clever video to several friends including some who aren't particularly big classical music/violin fans and they all LOVED IT! Great idea and hopefully it might encourage other musicians to take the same kind of "out of the box" approach to promoting their music. I love the video and loved seeing all my venues in the city!! What a great interview - thanks, Laurie! I'm a big Gil Shaham fan, and enjoyed reading this perspective of what it's like to juggle family (very young kids - yikes), marriage (to a fellow touring violinist - THAT can't be easy) and career. Most impressive! What a great interview - and I loved the video! I was smiling throughout. I never thought I would hear anyone play Zapateado better than Heifetz, but I loved the witty performance that Gil gives - not to mention the incredible and effortless technique. If you're working hard, Gil, it doesn't show! Stunning playing! You are one of my favourite violinists. I'll never forget hearing you play Bartok 2nd concerto in Haifa back in 2000. Bravissimo! More power to you both. Very inspiring! I was surprised to see a last track with the "Romance et Gavotte de Mignon, Op. 16". It sounds so different from the Sarasaste pieces that i am wonder why they added it. What can one say? Certainly full of energy!